Paperwilds is run by bookbinder, paper artist and photographer Freya Scott. Freya has been a bookbinder for 8 years and has worked for various binderies and institutions across the south of England. She has been teaching for the last four years in various places in London and across the country. She is currently principle instructor at Bound by Veterans, a charity that uses bookbinding and related crafts as part of a rehabilitation therapy for sick and injured veterans. In London she works in a joint studio called Reel + Fold, which is part-time bindery, part-time photography studio. She shares the space with a commerical photographer/DOP, and Ludo, who is her dog-shaped chief supervisor/cuddle supplier. So much fun! We learnt a range of different patterns from simple to complex, definitely recommend. The teacher was brilliant! She told us where marbling comes from and how it has evolved through the ages.Absolutely enjoyed every minute of the class! I will definitely go again! I had a really great time at the paper marbling at paperwilds! Freya was a fantastic teacher and introduced us to a range of techniques and marbling designs, whilst giving us an insight into the history of the craft. Freya and her studio partner Alec made us feel very welcome in their beautiful studio space. Overall, a wonderful day being immersed in colour and swirling patterns - I came away feeling inspired and full of ideas! My boyfriend Tom attended Freya's class. He said he had an amazing day of learning in a lovely, relaxing environment, and was able to produce some beautiful and varied paper marbling patterns. Freya is extremely knowledgeable and presented her understanding of the process in a generous, friendly manner, and really conveyed the detail, history and craft of the process. Highly recommended! This was a fantastic workshop. Freya is very knowledgeable and kind. It’s great to find something that can produce good results at a basic level but also inspire students to develop their techniques. I will be trying more at home! I found it really interesting and I will definitely start doing it myself after this workshop! The teacher was really kind and patient, even with the slowest students! Great job! I very much enjoyed this one day course. It was a pity I didn’t get to finish in the time available! 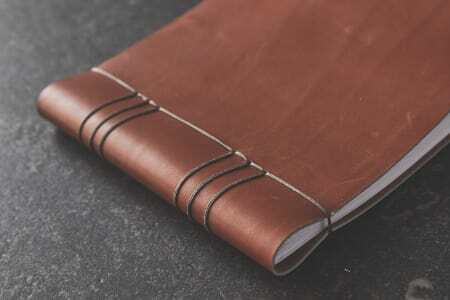 I learned how to make a notebook using Japanese Stab Binding. It was very absorbing and fascinating to see the book come together. Freya , the tutor , was absolutely great. Her explanations and demonstrations were very clear. She has a marvellous sense of humour and was incredibly patient, never minding about showing me things several times! I came away with a lovely notebook that I am proud to use! This was a shear joy to do. Freya is an excellent teacher and not only did I learn a lot, but I came away from the class inspired. I would recommend it to anyone. Great fun and a comprehensive setup that allows you to practice what you've learnt from home. I got to learn approx 6 traditional patterns or it you rather go off piste you can experiment to your hearts content. Freya is very patient and generous with her advice. 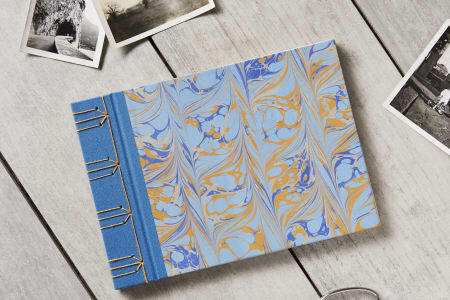 What attracted me to the the course was that she is a practicing traditional bookbinder and works in the industry that has a strong connection with marbling papers. A must try and comes highly recommended. I had a great time learning some creative skills! The environment was very friendly and relaxed - Freya was such a welcoming host and a very talented instructor. I hope to convince some of my friends to come along next time! Marbling with Freya is so much fun! I feel like I've learned a new skill I can keep playing at for a long time. I can't wait to use all the beautiful papers I made. The studio is bright and airy, a really lovely place to spend an afternoon. Freya really knows her stuff and is really friendly and approachable. We went home with loads of marbled paper, and she sent the one which weren't dry on to us. We were able to buy a really reasonably priced kit to carry on making marbled paper at home. I've even manage to sell one of designs! 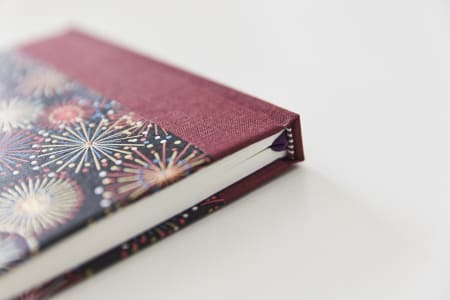 A must for anyone who loves book arts and paper craft. Freya is a friendly and patient teacher, and very quickly makes you feel comfortable. Her class is great fun and you will quickly be able to produce great results! 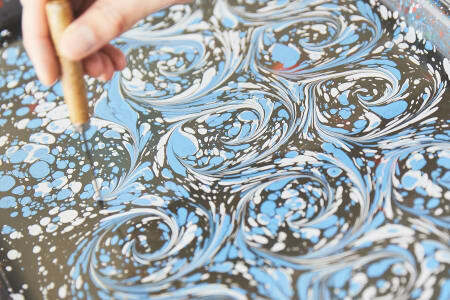 I would highly recommend her paper marbling course to anyone. 5 stars! Such an addictive pastime! Our tutor was fantastic. She was so patient and enthusiastic. The whole atmosphere was very friendly and I enjoyed the day immensely. I did Paperwilds’ paper marbling taster workshop which included preparation techniques for the size and mixing the alum to coat the paper, mixing and applying the paint on different types of paper as well as creating different styles of patterns. Very balanced between theory and practice/experimentation, I felt like I learned so much about paper marbling in a day, much more than a taster/intro workshop usually includes. I also made some new friends (including Freya’s adorable dog Ludo)!Freya is a fabulous artist and instructor, really patient, thoughtful and with a great sense of humour which helps people feel at ease even if they are absolute newbies.In short I had wholesome fun and left wanting more - I totally recommend it for anyone who enjoys paper arts or wants to have fun trying something new! Super workshop in the fun art of paper marbling.Freya is a very informative and enabling workshop tutor. She provided lots of practical know-how but also inspiration. As well as teaching us techniques with demonstrations and letting us practice them before moving on to the next, she also helped tease out the knowhow that we were building during the day so we could understand how to work with the inherent variables in the craft (e.g. pigment characteristics, heat...).We covered a lot of traditional patterns in this one-day workshop as well as colour mixing, paper preparation, how to manage the try of thickened water for best results...This workshop offered good value for money and was great fun at the same time. Plus, there was an endless supply of tea ! The workshop introduced several basic marbling patterns with time to practice each with clear instructions and support. Freya is very knowledgeable and taught us how to troubleshoot issues that we might encounter at home too. Loved it! Freya was so wonderful. I will come on the course again in 2018. Thank you. Fantastic! Freya is a really good teacher- very patient, creative, organised and kind. There was so much hands on work, it was brilliant. She got just the right amount of prep done that there was no waiting around, while she gently reminded us to prepare our papers in advance, so that we could keep creating, and also learn the steps needed to go home and work independently. Great space to work in too. Couldn’t recommend this course more. Great workshop! Freya was super helpful and took us a through a range of techniques that led to some beautiful marbled papers, would definitely recommend! Brilliant work shop. I couldn't have asked for more. Freya was personable, funny, highly talented and inspiring and a great teacher. I would recommend anyone interested in trying out marbling to choose this course. The class was great fun! Freya is very nice and a great teacher! She explained everything very well and was helpful and everyone in the group was able to get great results eventually. Marbling is a great way to be creative, whether you are experienced in art or not. It is a very rewarding activity! Everyone who loves color and process should give it a go. Had such a great day - brilliant teaching, so friendly and you come away with a skill you feel you could carry on at home now you know all the secrets! 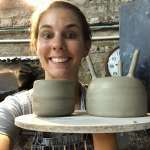 This was a fantastic course - Freya was a wonderful teacher and the course is really well structured so that periods of learning new skills/techniques are followed by periods of putting what you've just learnt into practice. It is also one of the very few craft courses I've been on where I've been genuinely delighted with what I made in the course of the day. Freya is a marvellous teacher and has extensive knowledge that she is happy to pass on to her students. It was amazing what we could achieve, even from our first attempts. The class was well run and relaxed, would highly recommend this workshop. It was really great, never thought I would try so much methods, and do so much paper marbling in only one workshop. The course was really interesting. Freya is a lovely person and a really good teacher. She knows a lot about marbling and can easily adapt to what you are trying to get out of this workshop. The atmosphere is relaxed and friendly. I would highly recommend this course if you are trying to get into marbling! Fantastic day! Freya is an excellent teacher - friendly, calm and patient. I learnt a lot and have left with plenty to try on my own. Spent a wonderful day learning how to marble paper. Freya is a great teacher and I came away feeling confident enough to try it at home - can't wait to get started! What an amazing class! Freya was so knowledgeable and friendly. She covered so many techniques in one day I really felt I got my money's worth and more! The paper that I made was then beautifully packed and sent to me when dried. I was so excited to receive it. And her dog also put a huge smile on my face. Thanks Freya for such a lovely day. Excellent course, I was really pleased with how quickly we all progressed from knowing nothing to creating incredible intricate patterns, the day flew by. Great - really fun and exciting, as you're never quite sure what the pattern will look like until you lift the paper from the tray. It's tricky to get marbling absolutely perfect, but you rarely end up with a total disaster as even air bubbles and splotchy bits can look like part of the pattern. Plus no matter what combination of colours you use, they never seem to clash! Freya provided a really great introduction to several marbling techniques. Yes, I do recommend this one-day course. It was a jam-packed day! I learned so much! The history of marbling, the materials used, the different techniques. and made so many papers. Excellent value for money. This workshop was excellent - really well designed so that you have an idea of the origins of paper marbling & theory, before learning various design techniques and producing lots of samples as the day goes on. Freya is lovely & friendly; tea & biscuits were on tap and Ludo was irresistible! A very fun, insightful and interesting workshop. Freya was a cheerful and friendly host - as was Ludo, the studio pet dog who was adorable. Freya really knows her stuff and her passion and knowledge about the history and technique of marbling really came across. I would definitely attend another workshop with Paperwilds as I had such a fabulous day being creative and with such great company too. 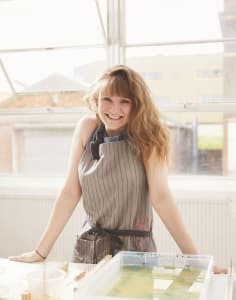 Fun and relaxed one day workshop learning paper marbling with Freya in her studio! Really interesting learning the process involved and got the opportunity to experiment with lots of different techniques. Such an awesome class! I was in London for a month visiting from Melbourne, Australia doing various art classes and Freya's paper marbling course was by far and away the best one for sure. Freya is a super lovely lady and is very knowledgeable and genuinely passionate and excited about marbling which makes the day really fun. She was even kind enough to organise for my prints to be sent to Australia as I was leaving a few days after. Highly recommend. I absolutely loved it, but I wish I could have stayed for longer to also Freya and Alex were nice to I would love to do it again. When I’m feeling a little bit better. Had so much fun at this wonderfully creative workshop. Learnt loads from the excellent teaching and demos and enjoyed lots of time to put it all into practice and produce our own papers. Really brilliant - would highly recommend. I could not have enjoyed this workshop more had I tried! I would highly recommend it to everyone! It was everything and more than I wanted it to be. Freya is an incredible teacher. I can’t wait to receive all my marbled papers and start marbling at home with my paper wilds starter kit! I enjoyed it. Location a bit off the beaten track & I can’t imagine anyone not driving there?? Its Lewisham more than ‘South’ ?? Bermondsey :))) Anyway, the course was good, learned a lot & enjoyed the day. Freya's marbling workshop is the best fun I've had in years and years and years. She is a gifted teacher, a master marbler and a lovely human being. It was great to spend time with Ludo as well. I learnt so much during the day, things that you just can't get from watching stuff on YouTube and reading the few books that are out there on marbling. I learnt lots of new technical terms, like 'goo'. And I had an absolutely wonderful day creating (is that the right verb?) page after page of the most stunning designs imaginable. Freya hovered quietly as we tried out each successive technique, offering encouragement and extra tips. I had ridiculously high expectations of the day before I arrived, having looked at Freya's wonderful creations online. However, I am delighted to say that my expectations were comprehensively exceeded in every way. If there were 10 stars, it would still feel that I was scoring too low. Fantastic! Brilliant! Thank you. Alisdair. PS I'll be in touch shortly for some marbling supplies. PPS Lovely group of people on the workshop. PPPS This was so much more than just an 'Intro'. Just amazing! Freya was the most amazing teacher and such a lovely person. I had a great day, met some lovely people, and left feeling inspired. Would recommend to anyone that loves being creative. Absolutely amazing day learning the craft of paper marbling! From start to finish, Freya was so welcoming and enthusiastic! She was a fantastic teacher and was so encouraging! Really looking forward to attending more courses here and learning some more marbling techniques! This was a fantastic class!! I had so much fun and really enjoyed learning how to marble paper. Freya was such a great teacher and was so knowledgeable. I would definitely recommend doing this class. A really enjoyable day. Looking at the sample book before the course started it seemed impossible we could go from zero to complex repeated patterns but Freya took us through it with enthusiasm and patience at the perfect pace. The day flew by. Highly recommended. A fantastically comprehensive guide to paper marbling from how to prepare your paper and paints to techniques for creating beautiful results. Freya was patient and supportive and really brought her passion to the subject. I really enjoyed the class and would happily recommend Paperwilds courses to anyone. Really great class: good vibe, in-depth technical insight without getting boring, amazing space and super nice teacher. I had a wonderful day in Freya's class, learning an enormous amount about the technique of paper marbling, and can't wait to try out what I have learned. After practice, I definitely want to go to a follow-up class. We had everything we needed, and Freya gave us information and demonstrations that helped the day pass all too quickly! I couldn't wait for the papers we printed to be sent on, and was excited when they arrived.... friends and family were impressed by this complete beginner's achievements. Thanks, Freya! A really lovely class to learn a variety of paper marbling techniques. Friendly, knowledgable instructor, nice facility, and ample chance to experiment with them. Highly recommended! The class was such an amazing learning experience. We were taught how to prep paper, paints, the moss bath and loads of different techniques. Our teacher was so friendly, had time for everyone and was generous with materials and tricks of the trade. Really makes me appreciate marbling as a proper artisan skill ! Brilliant workshop, crammed in so much yet didn't feel rushed and got to explore all of inner creativity. Can't wait to receive the papers we made in the post. Perfect of a complete beginner but flexible enough to be stretch for those who have a bit of skill already. What a great day! I had always wondered how books were put together and I now know. The course was well-paced. The instructor showed us everything in a very step-by-step way and as the class size was small, was on hand to help with the inevitable mistakes! The atmosphere was fun and there was a lot of laughter. The instructor showed great patience with us and created a very friendly and comfortable atmosphere. I love my notebook and I think I am hooked on bookbinding! Freya is a fantastic teacher, she's very patient and clear with instructions. She is also clearly really passionate and has an in depth knowledge of what she teaches. I am delighted with my finished booked and shocked at how well it turned out. A great workshop building on marbling skills learnt in the beginners marbling workshop. Freya is a very knowledgable tutor who is friendly and engaging. She skilfully steered us through lots of new marbling techniques and there were plentiful cups of tea and biscuits too. Ludo the dog was a highlight of the workshop stealing Freya's limelight with impressively bendy dog-yoga moves! Fantastic opportunity to try out new patterns and paints. It was a great way to help me to develop my skills and troubleshoot what I'd been trying since the beginners class. Paper Marbling Part Two was another excellent workshop. Great fun and highly informative, the day was an opportunity to have a refresher of basic techniques, an opportunity to learn new ones and pick up troubleshooting tips. Freya is an inspiring teacher and students are well looked after with nice refreshments and canine company from Ludo the dog. A unique experience and well worth travelling from Birmingham for. Excellent follow-on class! CONTENT After a warm-up to refresh skills and get a feel of the size, we moved on to learning several more patterns. Not only did Freya teach us the sequences for these patterns, she also focused on the kind of colour combinations that shows these patterns to best effect. After lunch we moved on to working with metallic paints. As off-the-shelf metallic paints can be tricky, Freya focused on teaching us how to work to the strengths of these paints and encouraged us to try vaining to maximise the potential of these paints. Even though there was a good focus on mixing techniques for different types of paints, the workshop moved on at a good pace allowing us lots of time to experiment. PRACTICALITIES Very clear pre-workshop email with directions. Plenty of tea and coffee during the day and tea and biscuits in the afternoon to re-energise for finishing on a high with Spanish Waves Adorable studio dog providing silent encouragement. Fantastic! Would definitely recommend the lovely Freya for any of the classes she teaches. She's really patient, kind and super creative. LOTS of hands on making. Really good value and such a lovely way to spend a Saturday. I'm just waiting for a part 3. I caught the paper marbling bug after attending Freya's class (Marbling Part 1) last year and was eager to learn more! Working with elusive metallic paints and getting them to stick to the paper was a highlight - I am so pleased with how beautiful and shiny the end results are! Really great hands on class, Freya was very supportive, patient and clear. Have come away with beautiful marbled treasures and an itch to do it all over again! A fab workshop! Freya is so calm and friendly. She really knows her marbling stuff! Freya is a great teacher - so clear and precise in her explanations and so open and friendly as a human being. It was a brilliant experience to produce something so technically complicated as a complete beginner - she is patient and kind. The studio has such a lovely relaxed feel - a really enjoyable day. Loved Ludo the studio dog!